"Godey's Lady's Book," founded in 1830 by Louis Godey and published in Philadelphia until 1898, was a monthly magazine that catered towards women. Thank you for sending me an image of your copy of "Godey's Lady's Book" from 1862. "Godey's Lady's Book," founded in 1830 by Louis Godey and published in Philadelphia until 1898, was a monthly magazine that catered towards women. Each issue included everything from essays and poetry to music and, most notably, the latest French fashion. These fashions were featured in the form of illustrative engraved, hand-colored fold-out plates, or prints. These very popular "Godey's fashion plates," as they've become commonly known, would often be cut out of the book by readers for framing and wall decoration. It was fun for me to see this book because I can still remember the walls of my grandmother's guest bedroom where many of Godey's fashion plates were framed and on display. In the 1950s my grandmother regularly combed antique shops in the Keene/Brattleboro region putting together her collection. Curious about an antique you have? Send a photo to bcoles@nhmagazine.com. If there are markings, please take a clear photo of them as well. If your submission is selected, we’ll have expert Jason Hackler appraise it. Hackler, manager/owner of New Hampshire Antique Co-op in Milford and partner of Jason Samuel Antiques, is a past officer of the Granite State Antique and Appraisers Association, a principal of the Active Appraisal Group and a member of the N.H. Antique Dealers Association. 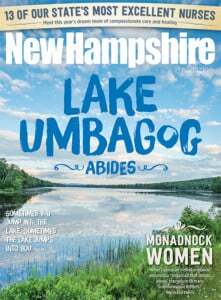 Coincidentally, I was recently reading the 2009 book "More Than Petticoats, Remarkable NH Women" by Gail Underwood Parker and recalled a connection of "Godey's Lady's Book" to one of NH's own leaders and pioneers. Sarah Josepha Hale from Newport, NH was famous for writing "Mary Had a Little Lamb" and lobbying with Abraham Lincoln to make Thanksgiving a national holiday, amongst numerous other pursuits, notably serving as the editor for "Godey's Lady's Book." The book was a coveted publication that helped to empower women, particularly through the efforts of Sarah Hale. In 1837, Godey hired Hale to be the editor. Under Hale's guidance, it grew to be the most subscribed to magazine in its time. The publication lasted nearly 70 years, 40 of which were led by Louis Godey and Sarah Hale as publisher/editor team extraordinaire. Your edition of "Godey's Lady's Book" was published in 1862 in the midst of the Civil War. During the war, issues of "Godey's Lady's Book" were smuggled to the Southern states; one can certainly imagine that these publications were a welcome distraction from the horrors of the war. With the Internet now making many of these Godey books and prints more readily available today the prices have come down. Presently the 1862 version can be found for sale online between $45 and $150; I would estimate your "Godey's Lady's Book," which appears to be in overall good condition, at $100.